The current Arms Act (which came into effect on 01. April 2008) defines the legal requirements for the acquisition of weapons and ammunition. It shows in detail what kind of weapons and ammunition can be purchased by whom, what conditions are fulfilled and what safety regulations have to be met. Please understand that we need to review your permission to comply with legal requirements. For example, the hunting license or the firearms license must be officially inspected and documented accordingly. 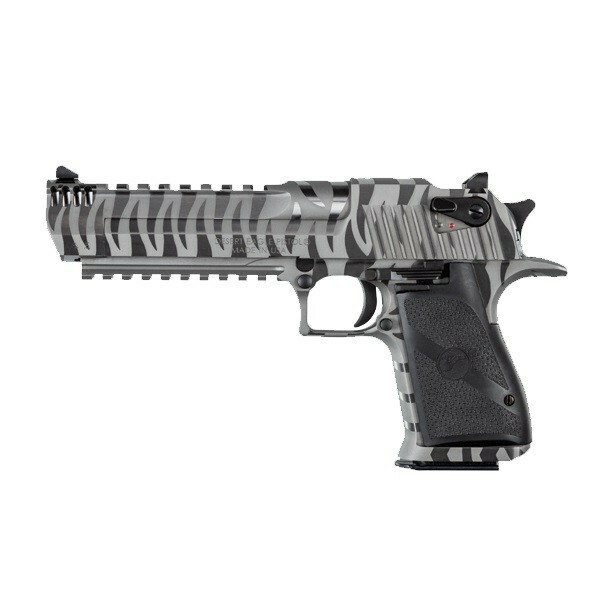 Caliber .44RemMag, Pistol Desert Eagle XIX Black Tiger Stripe New Style Stainless Steel, polygon barrel 6" picatinny/weaver rail with IMB-integral muzzle brake,, soft rubber grip, 1 magazine 8 rounds black, Magnum Research USA. New 2019! Particular Make: Desert Eagle XIX 6"
Kundenbewertungen für "Desert Eagle 6" White Tiger IMB"